Written for students in their fourth year of primary school. Continuing to build on skills and concepts covered in Music Room 3, Music Room 4 introduces: ‘Exploring Sound’ (vocal sounds, atmospheric sounds, found sound composition), plus further explorations of context & style and an end-of–year concert. Lyric writing begins in this level. 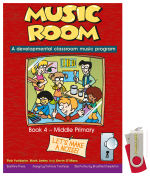 Music Room Book 4 +USB provides the full program in a physical book, with all audio visual included on a USB. This title is also available for iPad through the iBooks store! Click here to find out more information about eMusic Room. Here is a copy of the contents page for Music Room 4. To see what a lesson looks like, access the free lessons available under the Product Samples menu.